Heat oven to 450°F. In small bowl, mix 1/2 teaspoon of the salt, the garlic powder, paprika and pepper. Rub mixture all over beef. Place beef in small shallow roasting pan; tuck thin end under. Bake 20 to 25 minutes or until meat thermometer inserted in center reads 140°F. Cool completely. Meanwhile, in 12-inch skillet, heat butter and oil over medium heat until butter melts. Add brown sugar and onions; stir to coat. Cook 10 minutes, stirring occasionally, until onions begin to soften. Add wine. Reduce heat to medium-low. Cover; cook 10 to 15 minutes or until onions are very tender. In small bowl, mix sour cream, horseradish and remaining 1/2 teaspoon salt. 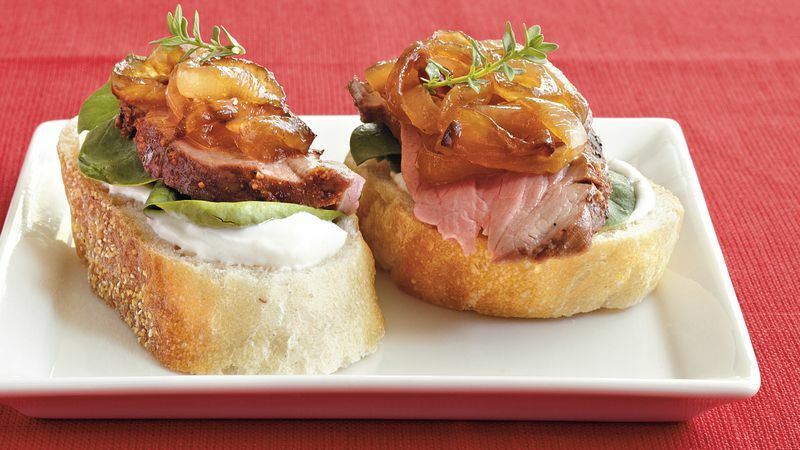 To serve, spread baguette slices with sour cream mixture. Top each with spinach leaves. Thinly slice beef; layer over spinach. Top with onions.